Cookie Love sure makes some good cookies! 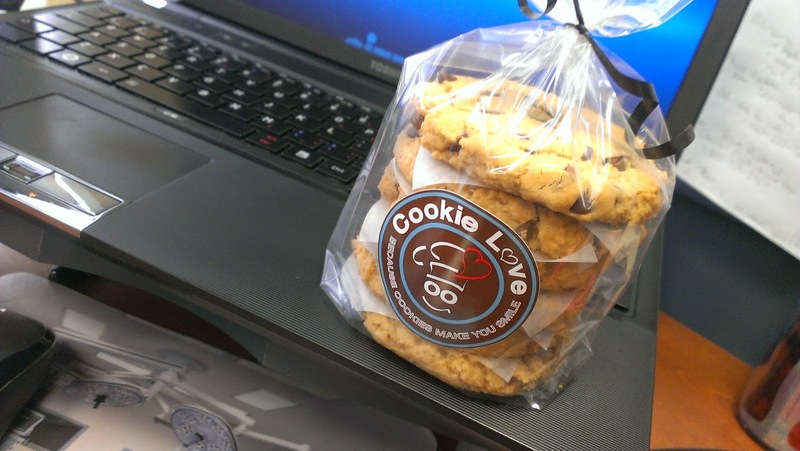 Our friend RL write about Cookie Love last year because of the great gluten free cookies they offer. This time, its our turn to give a review because Mike from Cookie Love wanted us to give a taste of their new gluten free chocolate chip cookie! So he dropped this off at my office. Oh boy is it a good cookie! If you like a nice soft cookie, you are going to love this gluten free chocolate chip cookie from Cookie Love. The shelf life of these so far are pretty good. I managed to fend off my cravings and they have lasted so far five days without getting stale. Which is really amazing for a fresh baked cookie. You can find Mike from Cookie Love at their cookie store located at 124st and 102 Ave downtown across from Mountain Equipment Co-op. Hope you enjoy these gluten free cookies on top of their already great gluten free cookie selection.